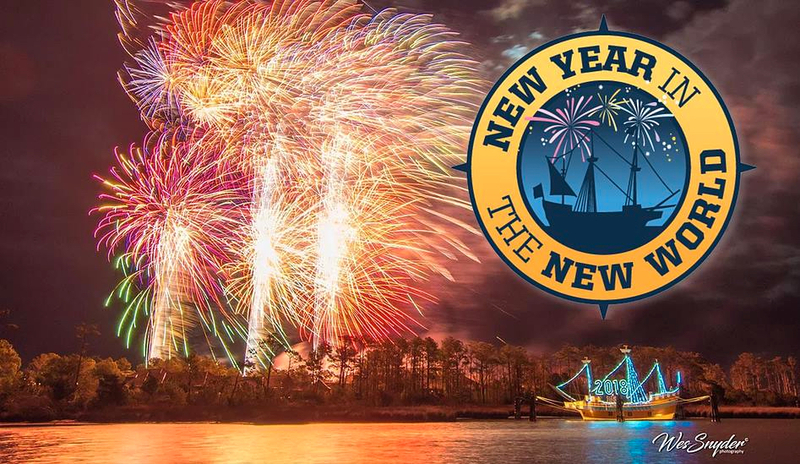 Manteo promises the largest New Year’s Eve fireworks in the state. If the weather holds, it may be. We had a fantastic Christmas here on the Outer Banks and with Christmas past, the next holiday to greet us is New Year’s Eve. It’s kind of nice—the Outer Banks offers our visitors and residents a couple of different ways to celebrate the coming of New Year. For families, check out what’s happening in downtown Manteo. Tod Clissold owner of Poor Richard’s and Cory Hemilright, owner of Bluegrass Island, got together and with some help from the town and other organizations have put created an event with something for everyone. Plenty of great live music, fireworks.weather permitting—last year it wasn’t—and street vendors and games. One really nice fouth… Fireworks? Yes, in the past, although last year the wind was too strong. Lot’s of food from restaurants and local street vendors and what might be one of the nicest touches, an 8:30 p.m. ball drop so kids can get in the fun. It can get a bit cold on the waterfront. OK, last it was painful cold, but the forecast right now doesn’t seem quite that extreme. There is, of course, lots of celebrations at local bars and restaurants. We did some looking around and here’s a few of the New Year’s Eve events we found. Locals Dee Thornley, Hugh Hammers and Rob Evans perform high energy favorites for your New Year’s Eve celebration! Music Starts at 9:30 and goes right on through when we ring in the New Year! Ring in the New Year with the Village Table & Tavern! To celebrate we’ll be offering a special 3-course menu which includes an appetizer, entree, dessert and a glass of bubbly. Chose from two dinner seatings: one at 5:30 pm and the second at 8:30 pm. Live music from Mama’s Black Sheep starts at 9:30 pm, and the party goes until 1 am! Advance reservations are required for the 3-course dinner which is $50 for the 5:30 seating and $65 for the 8:30. We’ll also be offering an a la carte menu at our communal tables and bar where seating will be on a first come, first serve basis. We like to usher in the New Year by creating a special five (5) course menu. This special menu is offered exclusively on New Year’s Eve. We save live music for another night simply because the main focus is on dining well and space is limited. We celebrate at midnight by counting down with a complimentary glass of bubbly, watching the ball drop, and making a lot of noise (with the help of noise maker favors that, thankfully, only come out once a year). There is always something happening on the Outer Banks. Come stay with Joe Lamb, Jr. & Associates and explore our world by the sea.